I can’t say I’m surprised that my initial piece about the storm systems currently hitting the West Coast like a firehose got so much traction online. It’s a weather cycle that looks to generate massive amounts of snow in the mountains over a short period of time (among other possibly less savory things). As I write this, NOAA is still calling for extraordinary precipitation centered on California’s Sierra Nevada. They are now predicting a third major storm pulse from this atmospheric river event to hit the area as soon as next Tuesday before the pattern finally breaks down next Thursday or so. 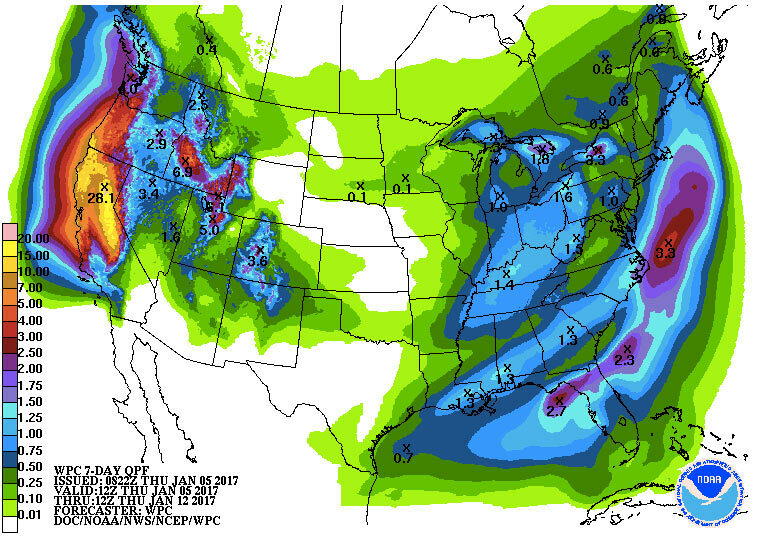 Today’s new seven-day QPF is, if anything, the most alarming yet and confirms increasing confidence in Storm #3 next week. It features the highest max precip number yet—28 inches. The bullseye has now moved north to the Lassen area but the Sierra ski country still looks to be on track for at least an additional 15 to 20 inches of precip, which keeps it well in line with all the outrageous sounding predictions about fifteen feet of snow above 8,500 feet from 48 hours ago. The real question, and the nail-biter for Tahoe, is going to be where the snow/rain line ends up during the next rounds of possibly warmer storms. The first storm comes in powdery and windy on the heels of a cold snap, picking up steadily through the afternoon and evening. The streets in Mammoth are jammed with Christmas vacationers slithering around on glare ice in huge cars with snow-covered windows. The supermarket in town has gridlocked with the checkout lines running far up the food aisles. At about 10 o’clock at night I hear someone snowmobiling down my street. There’s nothing exceptional about the storm yet, just a foot or so on the ground and typical breezy Sierra storm conditions. For locals who went through the drought years that ended last season, everything just feels right. The momentary blasting whiteouts, the huge snowbanks, the heavy equipment rumbling around town, the wet clothes strung around the fire… it’s like my life just snapped into focus. Digging out my truck was a rude awakening to say the least. I have to remind myself to slow down, that this is just beginning, that my back has to make it through the week and I can’t stroke out and die in my driveway before I ever get to ski any of this stuff. Let’s just say that the snow in the driveway isn’t exactly ultra-light. Mammoth Mountain is reporting 28 to 50 inches of new snow and is running only (but also impressively) the lowest lifts on the hill. It keeps dumping but the temps rise toward 32 in the early a.m. and the snow gets soggier. Around 10 or 11 o’clock there is a brief switch to light rain at the 7800-foot level in Mammoth. As of noon, we’ve received about 3 inches of water equivalent. With the newer wet snow, a sprinkle of rain, and the warm temps, the snow settles—what could have been four feet of cold powder slumps into two and half feet of high-density upside-down soft slab as wet snow continues to fall. By the way, if you want to get OCD with your storm voyeurism (and who doesn’t?) the ski patrol here has a unique and excellent website with real-time data from multiple weather sensors and their snow study site. I have to remind myself to slow down, that this is just beginning, that my back has to make it through the week and I can’t stroke out and die in my driveway before I ever get to ski any of this stuff. Speaking of which, the windows just rattled with the concussive thump of blasting on the ski area. Usually that’s an early morning procedure, but the patrol is trying to stay ahead of the game as the wind loads massive amounts of snow into deposition zones. With the wind-loading happening up high, they’ve got their work cut out for them in the coming days. When the dust clears there should be massive cornices across the upper mountain, huge drifts, spines, and assorted wind-sculpted features that you might expect in Alaska, but not at SoCal’s ski area. Many of them, along with every big open face and a lot of normally benign pockets and pillows, will need to be shot with artillery, blasted with hand charges, or manually ski cut to mitigate avalanche hazard, which is now officially rated High everywhere in the Sierra. Snowfall seems to have tapered off, is this the end of round one? No. It’s snowing fairly heavily again and seems to be increasing in intensity. Temps are still hovering right on 31 degrees here in town so the rain line can’t be far below us. 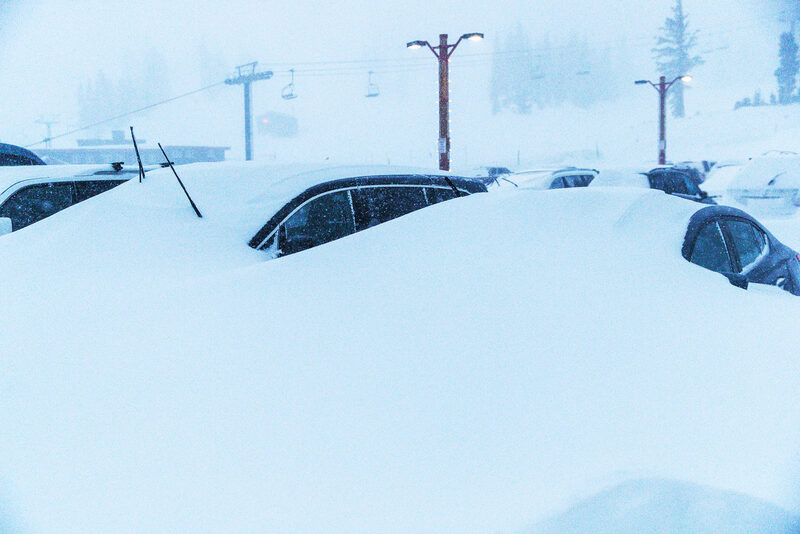 Tahoe must be a mess. The afternoon and evening have just left another eight or so inches of high-density snow on the ground at my house, yet another distinct layer to add into the mix. Not what you’d call good snow for powder skiing, but combined with the wind this is the stuff that will really plaster on the steeps, open up new terrain, and lay down that solid base that will keep us (hopefully) skiing until July again. With another foot possible overnight, the first two days of the Hydrological Hammering have stayed pretty much on track with predictions. Tomorrow should bring more showers and as much as another foot on the ski hill before we get a brief respite… and then the next and bigger round squelches into the Sierra. I’m guessing the total from this round of hammering will be about four to six feet of new snow above 9000 feet of elevation. It’s a decent start. Stay tuned for the next installment from atmospheric river ground zero here in Mammoth—tomorrow should feature more shoveling and also an exploratory skinning mission.